"Simple, super easy, quick, delicious, and pretty healthy, too!" Preheat oven to 400 degrees F (200 degrees C). Cover a baking sheet with aluminum foil; place a wire cooling rack on top and spray with cooking spray. Put chicken into a gallon-size resealable plastic bag. Add ranch dressing; seal and shake bag to coat chicken evenly. 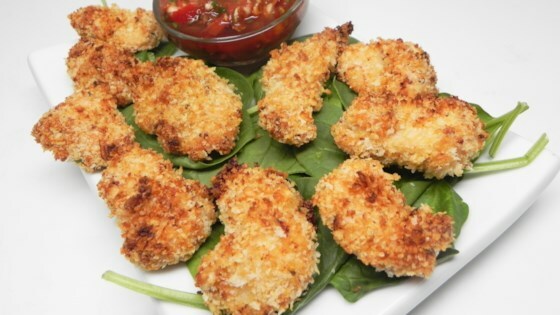 Mix panko, Parmesan cheese, garlic powder, and parsley together in a bowl; pour into bag with chicken. Seal and shake bag to coat thoroughly. Remove from bag; place on rack in a single layer. Bake in the preheated oven until no longer pink in the center and the juices run clear, about 15 minutes. An instant-read thermometer inserted into the center should read at least 165 degrees F (74 degrees C). Turn broiler on high; broil until crispy, about 1 minute. Crispy and quick chicken nuggets perfect for any ranch lover. Very good! Needs longer than 15 mins, so go for 20-25. I followed the receipe as stated. I did however bake an additional 5 minutes. It turned out great. Was so quick and easy. Will definitely make this again. So easy !! Kids ate it all. Added a little more parmesan cheese and salt and pepper and it was absolutely perfect! Thank you. No changes to original recipe were made. I definitely will be making these again! Super simple and tasty! A winner in my household! So quick and easy....and the kids loved them. Made it in my new air fryer Crispy outside Moist inside!